Belgian painter. 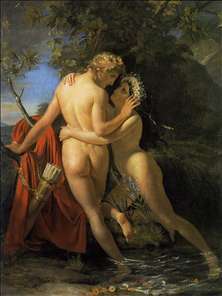 He studied from 1803 to 1808 under Joseph Franois at the Brussels Acadmie. 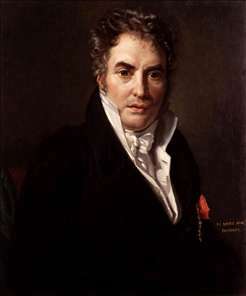 While still a student, he won several prizes; the Brussels Socit des Beaux-Arts, impressed by his Virgil Reading the Aeneid (untraced), which won first prize at the 1812 Ghent Salon, offered him a grant to continue his studies in Paris. From 1813 to 1816 he made rapid progress in the studio of David, with whom he returned to Brussels when the latter was exiled in 1816. The two artists became particularly close, and Navez s works from this time, such as the De Hemptinne Family (1816; Brussels, Muse d Art ancien) and St Veronica (1816; private collection), strongly reflect Davids influence in their technical accomplishment and naturalism. In 1817, with the backing of David and others, Navez obtained a grant to go to Italy, where he remained until 1821. He was initially at a loss without David but found encouragement among the group of French artists based at the Villa Medici in Rome: Victor Schnetz, Lopold Robert and Franois-Marius Granet were among his closest friends there. He became a fervent admirer of Ingres and took an interest in the Nazarenes . His painting accordingly developed a purist streak, although he held fast to the tenets of naturalism learnt from David. Typical of Navezs Roman work are his Hagar and Ishmael (1820; Brussels, Muse d Art ancien) and his first great biblical subject, Elisha Resurrecting the Son of the Shunamite Woman (1821; Amsterdam, Rijksmuseum), an imposing and austere work of undeniable monumentality. In Navezs portraits such as Man with a Guitar (1821; Charleroi, Muse des Beaux-Arts) a Romantic sensibility emerges, which is traceable to Ingres, although in others, such as Henri Voordecker (1816; Brussels, Muse d Art ancien), he was far more vigorous in his handling than Ingres. After his stay in Italy, he produced compositions, which he set in Italian-style scenes and in which several people featured in more sentimental or nostalgic settings. Jean Portaels (1815-1895), famous orientalist painter was to study under him and in marrying his daughter, became his son-in-law. See more details about "Portrait of Jacques-Louis David"
See more details about "The Nymph Salmacis and Hermaphroditus"